The Memorial Grove is a quiet place, with trees and benches, for remembering church Members and Friends who have died. Each memorial tile is engraved with the name and lifespan of the person being remembered. Memorial tiles are 12 inches wide by 3 inches high. Friends and family may select a pillar, a side on which to place the tile, and may reserve space beside another tile. The fee includes engraving, installation, and maintenance. The Memorial Grove Committee maintains biographical information about individuals memorialized in the grove. Family and friends are invited to the annual Memorial Grove Service, held in the fall, when we remember those who have died in the past year. Families and friends may also wish to consider a contribution to maintain the Grove, to the church’s Endowment Fund, or the General Fund. For questions related to other memorials, please contact the church office. 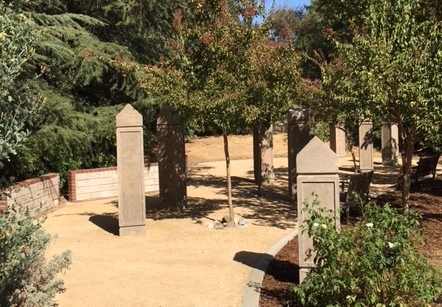 The Memorial Grove was made possible through the generosity of members of the UU Church of Davis.